I know I just posted this irresistible recipe for Buffalo Chicken Grilled Cheese two days ago, but after serving that one up Alec immediately requested more. I still had half a bottle of buffalo sauce, so I decided I'd switch our usual pizza night into Buffalo Chicken pizza night. Per Alec's specific request, of course. I'm not posting specific recipe cards for this one because it is pretty self explanatory. Alec really wanted it topped with "whatever was in the sandwiches," but there was one little problem with that. The sandwiches were loaded with cream cheese, and arguably that was the most important and delicious part of the sandwich. Anyway, Alec and I love cream cheese. My brother, my best friend, my brother's girlfriend, Alec and I love cream cheese. So, anything with cream cheese on it automatically exactly what we want to eat. Unfortunately, I left the cream cheese out on the counter by accident after making the buffalo chicken grilled cheeses. Alec was very discouraged by this news, but I managed to still win him over with the cheese combo on this pizza. Back to the recipe. Okay. First, get your pizza dough ready. May I suggest this recipe for pizza dough? Look out how nicely it comes out of the bowl it has risen in. It is so easy to work with. Then, cook chicken chunks in olive oil until done. Spread the dough out on a baking sheet or pizza stone or whatever you'd like to use. Then, add some olive oil and garlic and spread it around. Notice the hole in the dough on the right side...that is from the top of the olive oil drizzler...I accidentally got a little over zealous while coating the pizza and stabbed a hole right into the dough. Don't forget to poke your dough with a fork so it huge bubbles don't form in the crust. I tried to skip this step because sometimes I like when the crust bubbles and forms crispy air pockets, but this is Alec's favorite step. He used to make pizzas at a deli and insists on the vitality of poking it every. single. time. He some how managed to walk over right during the instant that I was trying to skip the fork step. Oh well. Love is about compromise, right? A pizza is still a pizza. Add some ranch or blue cheese and spread that around. Then, remove the chicken from the heat and stir it in with some buffalo sauce. 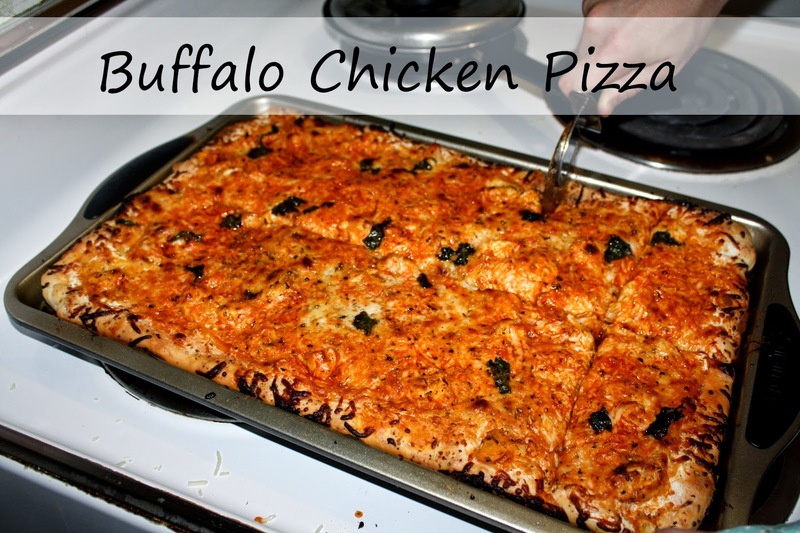 I used pre-made Buffalo sauce, but you can make your own. Sprinkle your dough with mozzarella cheese and grated Parmesan. Then top with the chicken and the sauce. And top it with more mozzarella cheese, fresh basil, oregano, black pepper...whatever you like on your pizza. Bake at 350 for about 20-25 minutes or until done. Don't forget to enjoy it with a nice cold glass of milk because that Buffalo sauce is spicy!